Some of the arrows below reference our Disease and Curses table. Ice Arrow – A shard of razor sharp ever-frozen ice is fastened to the end of an arrow. A hit from an Ice Arrow causes the area surrounding the wound to freeze for 1d4 hours. Net Arrow – The head of this arrow is actually a small clay pot containing a spring-loaded silk net, on a hit, the target makes a DEX save (DC 13) against being restrained. on it’s turn, the target can make a STR check to break free (DC 16). Acid Arrow – The glass head of this arrow shatters upon impact spraying the target in corrosive acid. On a hit the target takes an additional 1d4 acid damage. Non-lethal Arrow (blunt head) – does blunt instead of piercing damage. 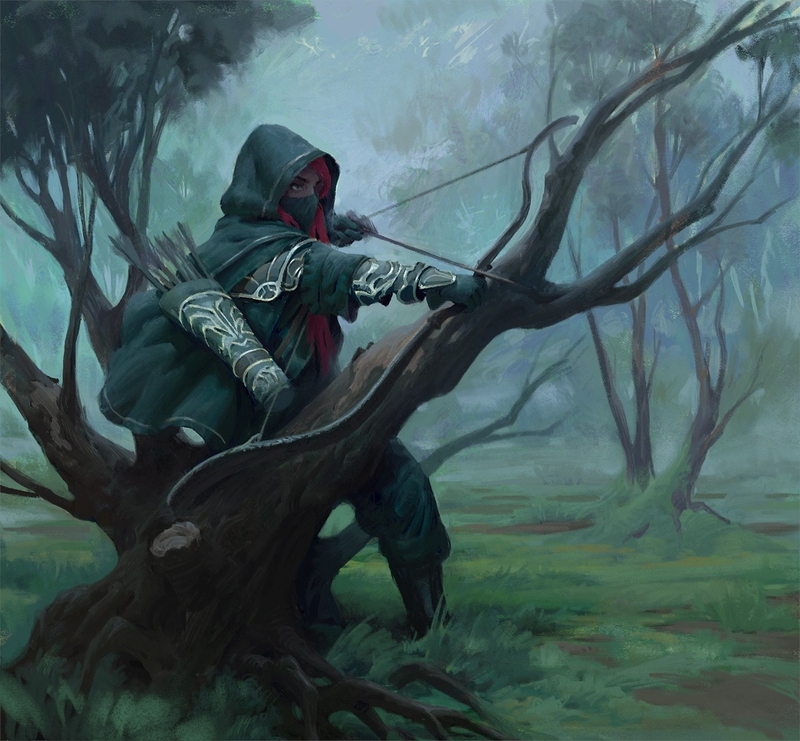 Rose Thorn Arrow – on hit extra 1d4 piercing from thorns and target must make a DC 15 STR or DEX save or be ensared for 1d4 rounds (can attempt to Str / dex to get free each round), 1d4 piercing damage each round the ensnared creature moves. Grappling Arrow – Arrow with a strong head that will hold up to 300 lbs of weight on an attached 100ft length of rope. Small Game Broadhead – Broadhead with extending fins that will decapitate small game (CR 1/8 or lower), due to the precision needed, the target gets +5 to AC. Shock Arrow – A thundergem is sharpened into a point as this arrow’s head. Upon a hit the brittle gem shatters, releasing an additional 1d8 lightning damage in a 10′ radius. Water Arrow – When this arrow makes contact, it releases a burst of water that extinguishes any source of fire no greater than a five foot cube. Elementals attuned to fire are weak against it’s damage. Moss Arrow – When this arrow is fired at a surface, creeping moss rapidly spreads to a circle with radius ten feet around the point of contact. Walking or climbing on the moss grants advantage on stealth checks to remain silent. Rope Arrow – When fired, this arrow releases 25 feet of hempen rope behind it. Choke Arrow – When the arrow makes contact with an object, it explodes into a cloud of noxious fumes in a sphere with a radius of 5 feet. Those inside choke as if you had casted the Stinking Cloud spell with DC 12. Alchemists Fire Arrow – contains a small vial of alchemists fire, dealing an additional 1d4 fire damage. Thundersteel Arrow – made from meteoric iron which has been imbued with the essence of the sky domain, deals 1d4 lightning damage in addition. Boxing Glove Arrow – Stuns an enemy or knocks them prone on hit. Arrow of Healing – Deals 1d4 damage, heals 1d8 hp. Barbed Arrow – This cruelly barbed arrow does normal damage going in, and 1D6+2 damage coming out. If carefully removed (takes 1D6+1 rounds, DEX check at DC 15), no damage; half damage if you fail the roll. If left in, 1 damage per round spent doing anything but remaining carefully still. Arrow of Returning – After firing and striking something, the arrow will vanish in a puff of smoke and return to your quiver. Arched Arrow – curved slightly, with air channels engraved onto the tip. When fired, flies in a circle of diameter 60ft in the direction the arrow is curved toward when aiming. Crescent Moon Arrow – causes slashing damage with it’s broad cutting head. Once hit the target it hooks itself in the flesh as the wound closes behind it. Causes bleeding. Not effective against armor. Not effective at long range. Can be used to cut objects further away, like ropes for traps and such. Superior Smoke Arrow – Creates a Fog Cloud after 2 turns. Scorpion Arrow – Does an additional 1d4 poison damage. Arrows of the Wraith – Ethereal arrow tips don’t hurt most creatures but is devastating to ghosts and other spirits. Arrow of Whooshing – makes a sound like someone making the sound of an arrow flying through the air as it flies through the air. Arrow of Blinding – as it impacts the target, it explodes in a flash of light rendering everyone who was not averting their eyes blinded for 1d4 rounds. Arrow of Delay – when fired the arrow freezes in place mid-air, thawing one round later and targeting the original targeted location. In addition to normal damage, on a hit the target is frozen in time for one round, unable to take any actions. Pointy Twig – sold by a goblin travelling merchant, he swears it’s an arrow of never-missing. It’s actually just a pointy twig. Buzzing Arrow – An arrow with a head coated in honey. When it hits a target, a swarm of bees is summoned, centered on the target. The bees are not friendly to the user, but likely won’t attack unless provoked. Splitting Arrow – An arrow that splits into 3 separate arrows mid-flight. There are rarer versions that split into 5 and even 7. Suckerpunch Arrow – Arrows that have a light metal ball instead of a pointed head. Better for knocking out targets with a shot to the head or knocking the wind out of them with a shot to the gut. Incredibly nonlethal. Light Arrow – These arrows deal radiant damage instead of piercing. They appear to be made out of pure light while emitting none at the same time. They leave a streak in the air, marking their path for up to an hour. Vampire Teeth Arrow – While not actual vampire teeth, they look pretty close. These arrows deal necrotic damage instead of piercing. The teeth may be recovered after battle to gain the damage dealt with them as healing or temporary HP. Glass Tipped Arrow – Either solid or hollow to fill with alchemy items. Sleep Arrow – using sleep powder, it bursts on impacts causing one creature hit to make a con save or fall asleep. No additional damage. Flare Arrow – creates a flare like projectile. If shot skyward can be seen up to one mile away. Only does 1d4 additional fire damage. Grapple Hook Arrow – does not do standard damage. Can be used as a standard grapple hook as well as an attempt to attach it to a target. Flash Bang Arrow – this arrow is tipped with a small grey canister that explodes in a 10 foot radius on impact. Creatures in the blast must make a DC 14 constitution save or be blinded and deafened for 1d4 rounds. The creature may repeat the saving throw at the end of each of his turns. Stalker Arrow – upon impact, this arrow lodges a small magical tracker in its target. The archer now knows the location of the target for 24 hours. Taser Bolt – upon impact, the target must make a DC 14 constitution saving throw. On a fail, the target is now paralyzed, as if affected by the hold person spell. The saving throw may be repeated at the end of each of the targets turns. Scrying Arrow – It takes a moment to prep the scrying arrow. You look into the foggy glass and your non dominant eye loses sight for a second before reforming inside the glassy bulb. This effect lasts for a minute. This arrow can then be shot. Deadweight Arrow – Once its stabbed into a surface, the target’s weight increases to 50 pounds. Curved Arrow – An arrow with a slight curve in it, used to hit targets behind cover. Injection Arrow – An arrow with a needle on the tip used to inject enemies with poisons and other alchemical brews. Armor Piercing Arrows – Tipped with special metals that ignore AC, +2 to hit. Hollow Tipped Arrows – It breaks off inside the victim causing more damage, but are harder to penetrate armor with. -1 to hit, +1d4 damage. Shadow Arrows – Arrows exposed to alchemy that allows it to go through an object or person and pierce something else. Smokescreen Arrow – Tipped with a smokebomb. Causes a cloud of smoke that obstructs vision for 1d4-1 rounds, moves 10ft in the direction of the wind every turn. Binding Arrow – Designed to explode on contact with a sticky goo that hardens almost instantly, DC 15 strength check to break. Can be used to stop or hinder movement. Gossip Arrow – on a hit, the archer discovers one mundane secret about the target. (The bandit loves knitting kinda secret) this secret is broadcasted in a 30ft radius by an ethereal voice. Edible Arrow – this can be shot and break like a normal arrow but is unrecoverable. Otherwise provides the effect of one goodberry with no time spoilage. Navigators Shot – upon firing upwards, the arrow travels 80ft upwards before going 50ft towards a goal (find a target or location) the archer is currently seeking. The magic loses effect if it impacts anything before the ascent. Cupid’s Lust – these pair of arrows switch the minds of the targets for 24 hours when struck with the tip. Evertrue Arrow – when this arrow is fired, a target will be hit. Maybe not the one you’re aiming at, but the arrow will continue to travel across the surface of the plane it was shot on in a random direction that changes every minute until it hits a target. Moist Arrow – upon impact, any surface in a 10ft cube will immediately be drenched in a thin layer of water. Arrow of Missile Attraction – on a hit, the target becomes missile attractive. Any missile / projectile that passes within 20ft of the victim has a 2 in 6 chance of being redirected towards the victim. Arrow of Monster Attraction – Any target hit by this arrow will attract any monster within 200ft. Monsters (with below human int) will treat the person or creature hit by this arrow as hostile. If arrow hits an inanimate object or the ground, any monster (with below human int) drawn to it will treat everyone in the area as hostile. Arrow of Illusion – arrow creates an illusion of the archer at the impact site. Arrow of Teleportation – user is teleported to the impact site of the arrow. Arrow of Anti-Magic – Arrow dispels all magic spells and effects within 10ft of it’s impact. Vampire Arrow – An arrow made from bone that appears to be covered in dozens of tiny holes near its tip. On a hit, a vampire arrow begins rapidly draining blood from the target’s body, causing them to take 1d6 necrotic damage at the start of the target’s turn until the head of arrow is removed from the body. These additional effects do not occur if the target has no blood or similar essential body fluid. Anti-Ballistic Arrow – A thick arrow that has a rounded tip, with fletching that constantly adjusts and readjusts itself. Upon being fired, the arrow seeks out the closest moving projectile that is within 30 feet of any point of the arrow’s flight path. The arrow changes its direction to intercept the moving projectile, and a successful attack roll against an AC of 15 results in the intercepted projectile being knocked out of the air and/or destroyed. Blight Arrow – A sinister looking arrow made from a dark wood that seems to pulse with life. On a hit, the wooden shaft of the arrow wiggles and writhes its way into the body of the target dealing an additional 1d4 damage on the hit and at the start of each of the target’s turns thereafter until the wood is removed with magical restoration or a successful DC 16 Medicine check. If the shaft still remains inside the target’s body when the target dies, 1d3 twig blights burst forth from the target’s body 2d4 rounds after the creature’s death. The twig blights are hostile to all creatures other than each other, and attack nearby creatures until they die or there are no creatures left to attack, at which point they go off in search of more victims. Screamer Arrow – A transparent, fragile arrowhead filled with volatile sonic energy causes this arrow to mildly vibrate at all times. On a hit, the arrowhead shatters and releases a ear shattering scream. Instead of dealing traditional damage, all creatures within a 30 foot radius of the arrows point of impact must make a Constitution saving throw. A creature takes take 2d8 thunder damage on a failed save, and half as much damage on a successful one. A creature made of inorganic material such as stone or metal has disadvantage on this saving throw. Any nonmagical objects that aren’t being worn or carried also take the damage if they are in the radius. Cannon Arrow – An arrow seemingly made entirely out of metal that is still light enough to be used, faintly glowing runic symbols cover every surface. Upon being fired, the arrow transforms into a cannonball that magically continues following the arrows flight path. A creature that is hit with the cannonball takes 8d10 bludgeoning damage and must succeed on a DC 22 Strength saving throw or be knocked prone. Foecrusher Arrow – An arrow with a very large head that is disproportionate to the rest of the arrow’s body, that somehow weighs the same as a normal arrowhead. Upon being fired, the arrow begins to rapidly grow in size over the course of its flight. For every 10 feet the arrow moves, the arrow’s damage increases by 1d6 piercing damage. If the arrow travels at least 100 feet, every creature within a 5 foot radius of the arrows point of impact must make a DC 18 Dexterity saving throw. A creature takes the arrows full damage as bludgeoning damage on a failed save, and half as much damage on a successful save. The damage is done instead of the arrows single target damage, not in addition to it. The radius of the arrows point of impact increases by 5 feet for every additional 100 feet the arrow travels after the initial 100 feet. Whistling arrow – A non-magical arrow with a wiffle ball-like attachment affixed to the shaft behind the point. It makes a shill whistling sound as it travels through the air. Inexpensive. Silence Arrow – An arrow with a fog-filled glass pearl instead of an arrowhead. It casts the silence spell in a 20 ft spherical radius lasting for 5 minutes where it strikes. Glass-Break Arrow – The arrowhead is high quality ceramic and very lightly touched with enchantment so that it thoroughly shatters glass. Despite being enchanted, detect magic will overlook it most of the time. Inexpensive, but only shops catering to thieves and mischief sell them. Possession may be a crime in some areas. Tracer Arrow – Glows when fired so you can see the arc of the arrow and where it lands. Inexpensive. Grease Arrow – An alchemist’s vial of grease replaces the arrowhead and spreads grease on whatever surface it strikes. Flightstopper Arrow – A creature that is flying or attempting to fly must make a constitution save before using its movement. On failure, it cannot gain altitude and instead drops 60 feet. A flying creature does not take fall damage if it is forced from the sky by the flightstopper arrow. The throw is repeated every time the flying creature tries to use its movement. The effect lasts one minute or until the arrow is removed, whichever comes sooner. Wyrmslayer Arrow – Deals double damage to dragons and like kin. Compass Arrow – Ordinary when fired but swivels to point north when balanced on a finger. Trickstrike Arrow – The arrow teleports midfiring so that it appears to have been fired from a direction of the attacker’s choosing instead. The accuracy is the same as a normal arrow. Bluff Arrow – A regular arrow with an extremely persausive letter tied to it. Black Arrow – Dwarven-made it is ancient and capable of piercing dragon hide. Huntress Arrow – The Goddess of the Hunt blessed this arrow. Hits with the force of a falling Oak tree. Arrow of the Feywar – Upon a successful hit transports the victim to another point nearby or another point on the nearest continent (flip a coin to decide). Arrow of Ricochet – Considers full cover to be half cover. Arrow of Desperation – Gains a +4 bonus when the archer or one of their companions has less than a quarter HP remaining. Mind Spike Arrow – Deals only psychic damage. Target has disadvantage on wisdom saves until next turn. It is pink in colour. Skeletal Grasp Arrow – An arrow of bone with a grasping hand on the front. If target is struck, grasping skeletal hands raise up from the ground dealing bludgeoning damage and restraining the target and those caught in the AOE. 5 foot radius. Meteor Shower Arrow – A Pure black arrow that marks a target for a meteor shower. Meteors are summoned and take 1 turn to arrive. After 1 turn a shower of massive flaming meteors rain down on the target dealing LOTS of fire and bludgeoning damage. 15 foot radius. Sentient Arrow – The arrow is actually a living organism shaped like an arrow. Its head is the arrow head. When drawing blood it sprouts its thin limbs and begins trying to inject itself inside its target host. The initial strike does damage and the target must succeed a constitution saving throw or else the creature will successfully dive into the host. While, it will deal 1d4 damage per turn and the host can feel the creature moving around inside. Dryad’s Kiss Arrow – Upon a successful hit by this legendary arrow the target is wrapped in vines and dragged into the earth. On a miss the arrow sprouts vines and roots that creates an oasis of permanent plant life and sprouts another arrow every century. Quiver Mother Arrow – As long as this arrow is in your quiver it makes 15 arrows per day. Drow Ascension Arrow – Touching these arrows bathes the shooter or anything it hits in shadow for 1 hour. Jagged Arrow – When it hit’s a target, it does 1d4 piercing damage every 12 seconds (2 turns) until removed by a medicine check of 15+. Zipper Arrow – Does regular damage, but the when the arrow is ripped out by a PC, it does 4d4 damage. To rip the Arrow out, a PC needs a prerequisite strength of 15. The actual arrow has many small spikes and sharp edges on it, and near the base of the arrow is a large pull handle. Haunted Skull-Dread Arrow – Does regular damage. If arrow isn’t pulled out by before 3 turns are over, the creature gains either a minor curse from a d100 table, or a disease from a d100 table. If it is a critical hit, then on the first turn the effect activates. Arrow of Agitation – on a successful hit, the target experiences varying nervous agitation, which affects to hit rolls and any bonuses to AC for Dex. Roll a d4, and subtract that number on to hit rolls and Dex-based AC. The effect lasts for 6-8 rounds. Ethereal Arrow – Upon using a command word, this arrow shifts between the material and ethereal plane. Can be used to shoot through allies without harming them or to shoot through covers. Babel Arrow – on hit, this arrow makes you forget the languages you speak and speak languages you didn’t beforehand for 1d4 hours. Spoil Arrow – on hit you have a horrible taste in your mouth that distracts you from whatever else you were doing to go seek water. Blurry Arrow – blurs vision for 1d20 minutes. Short Jump Arrow – Arrow range is only 30 ft but allows you to teleport to anywhere within the range that it lands. Pulling Arrow – can pull 300lbs of weight that is tied to the arrow for 1d100 feet. Invisibility Arrow – on hit, target vanishes for a whole 1d12 minutes. Blessed Arrow – does extra 1d4 damage to undead. Snake Arrow – this arrow release 1d4+2 snakes when hitting a enemy (could be a small clay vase). Bull Arrow – Designed to puncture heavy armor and animal skins, the Bull Arrow has a small cache of gunpowder on the end that only detonates on contact with a hard enough surface. Deals 1d4 piercing damage, and an extra 1d8 bludgeoning damage if the target has an AC over 16.